Just like the music that lifts your day, this diamond pendant will assist to effortlessly soar through your day. Crafted to appear as a saxophone, the pendant is made of 18K gold. The intricate design is embellished with sparkling diamond stones. The diamond pendant is an accessory dedicated to music and the pleasure it brings. This magnificent diamond pendant design drapes beautifully over your silk saree to give the perfect melodic finish to your outfit. Gift this piece of jewellery to any musician to let them know your admiration for their passion. Music can soothe the heart and this Saxophone pendant reminds you the power of music every time you dangle it around your neck. This diamond pendant hand crafted just for you will bestow the gift of harmony to your life. 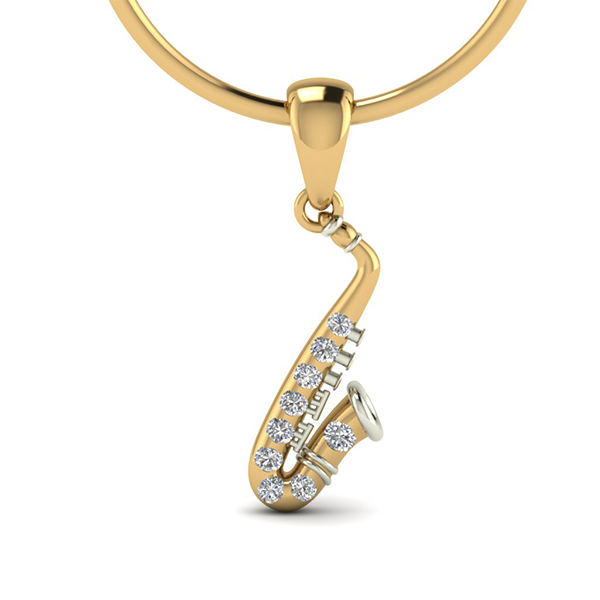 The pendant will make you want to play the saxophone and gratify your love for music. Wear this pendant around neck to express your individuality in style and grace!